If you are just like us, huge Copenhagen lovers, you might have stayed at the Radisson Collection Hotel in Copenhagen, known as the world’s first design hotel by designer and architect Arne Jacobsen, one true home to Danish modernism, which was constructed in 1960. Now, the Fritz Hansen‘s design team stands behind five new suites, each one honouring designers who has a special relationship with the company and its history. Each suite is specially built around a theme that reflects the designers’ individual aesthetics and design concept. Unique furniture, lamps and accessories provide the framework together with works of art made specifically for each room. The designers are Cecilie Manz, Poul Kjærholm and Arne Jacobsen, together with iconic designs from KAISER idell and GamFratesi. 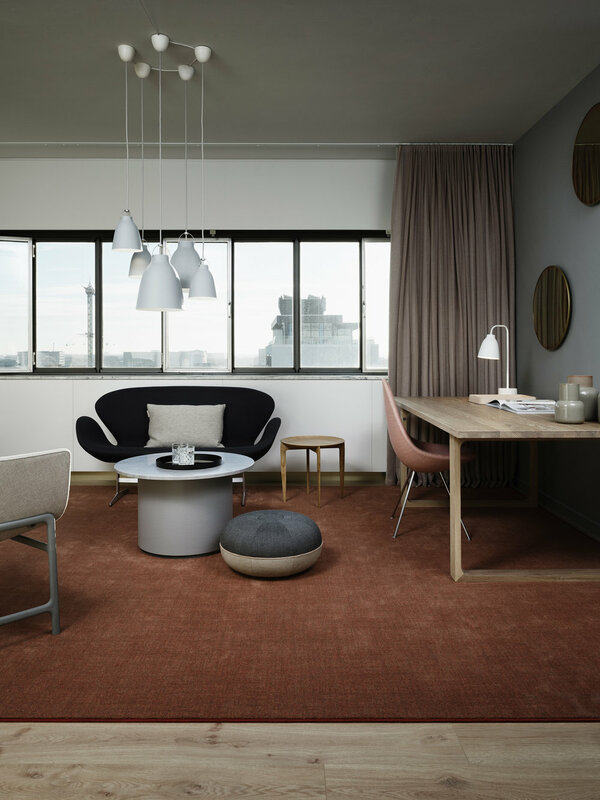 In addition to these, they also present two Fritz Hansen suites, one Classic and one Contemporary, where furniture and handicrafts from selected designers are carefully curated. “With the Signature Suites, we want to give design lovers a total experience in a very personal and unique universe which cannot be seen anywhere else. Our design team has carefully selected all the qualities, colours, furniture and accessories and where we did not have it available at hand, we drew and built it from scratch. You can therefore experience a hand-sewn tray in leather and the first ever SwanTM chair upholstered in velvet, just to name a few examples. 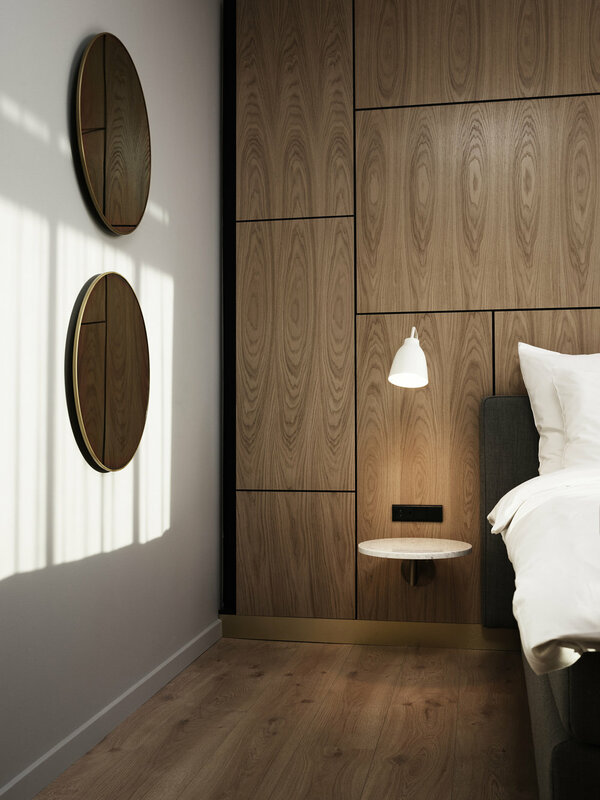 We hope the guests will feel welcome and enjoy their stay in the individual suites for their creativity, aesthetics and accommodation.” Christian Andresen, Head of Design, Fritz Hansen. We choose two rooms to share with you, the Signature Suite 1006, designed by Cecilie Manz and the Signature Suite 506, the Fritz Hansen Contemporary room. The Signature Suite 1006 by Cecilie Manz, a light, playful and feminine vision greets the guest, with a colour scheme dominated by pink, white and pale grey mixed with natural wood. Specially designed interior has been created, in the form of the Cecilie Manz’ pouf in new colours and the MinusculeTMchair in new fabrics. The EssayTM table in solid oak and the CaravaggioTM lamps which illuminate the room fit nicely with the Earthenware ceramic collection, all of which create a homely and inviting atmosphere. All designed by Cecilie Manz. Cecilie Manz´ contribution to the Signature Suite is a collage, telling the story of the materials, textures and colours that inspire her and so illustrating the tale of one of Denmark’s most interesting modern designers. 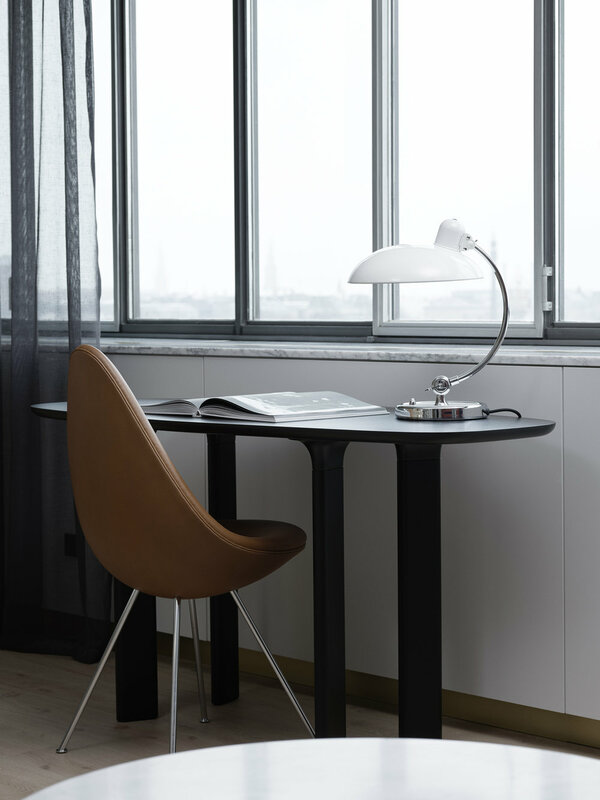 The Signature Suite 506, the Fritz Hansen Contemporary room, is where white KAISER idellTM lamps greet the eye in this modern interpretation of a hotel suite. Presented as wall-, pendant-, floor- and table lamps, the iconic Bauhaus designs illuminate the room. At the same time, unique sofa tables made by Fritz Hansen’s design team from solid wood with marble tops, create a centerpiece, both literally and aesthetically, for the modern Jaime Hayon furniture. This includes the RoTM lounge chair, the FavnTM sofa and a custom-made AnalogTM table together with his playful throw, which is used as wall decoration. The combination of the Danish and Spanish design languages creates a casual and informal atmosphere in this modern mix of unique furniture. Great place to stay for your next visit right?